The Asimmetrica P-31 kitchen and poultry shears rest in the hand beautifully and comfortably. This multiple purpose instrument is good for all household, hobby or garden jobs. Because of their asymmetrical geometry, their special blade and serrated design, these shears are very well suited for cutting poultry. In addition, they function as a bottle opener and a wire cutter. With serrations on the inner side of the shanks, caps and corks can be loosened without difficulty. 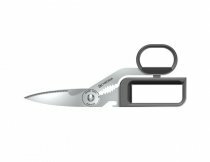 The shears can be disassembled very simply for easy and thorough cleaning, and they are safe in dishwashers as well. P-31 is suitable for both left-handed and right-handed use.